Under Louisiana workers' compensation or workman's compensation laws, Louisiana employers are required to provide workers compensation insurance to employees who are injured from a work-related accident or occupational illness. Compensation can include paid medical care and lost wage compensation. Louisiana workman's comp insurance is administered by the Louisiana Office of Workers' Compensation Administration. The Louisiana Office of Workers' Compensation estimated that approximately 20,000 workers are injured on the job in Louisiana each year. The goal of workers' compensation is to eliminate the need for employees to file a personal injury claim against their employee if they are injured on the job. This is considered a trade-off between the employee, who accepts a limited monetary benefit, and who avoids a protracted and potentially very expensive legal battle. The employer also avoids an expensive court battle but must provide immediate medical benefits and potentially lost wage benefits to the injured employee. Employees who have been seriously or permanently injured or if have been denied workers' compensation after a Louisiana work injury should contact a Louisiana workers' compensation lawyer. Employees may also need assistance from a Louisiana work comp attorney if they have been wrongfully terminated. 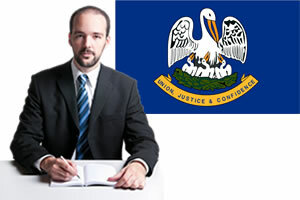 Louisiana lawyers can help protect and defend the rights of injured Louisiana workers. The employee was injured while they were intoxicated. Common Louisiana work injuries or occupational diseases which are generally covered by Louisiana work comp insurance can include: Amputations of arms or legs, Rotator cuff tear, Concussions, Torn Anterior cruciate ligament (ACL), Heart attack or strokes on the job, Torn medial collateral ligament (MCL), Carpal Tunnel, Torn meniscus, Diseases caused by inhalation of chemicals or other toxins, Neck injuries, Bulging disc, Abrasions and burns, Knee replacement, Hearing loss, Reflex sympathetic dystrophy. Workers' compensation in Louisiana can include medical benefits, temporary total disability benefits (TTD), supplemental earnings benefit, permanent partial disability benefits (PPD), and permanent total disability benefits (PTD). Lousiana Medical Benefits - Full medical benefits are provided for work injuries. Medical benefits are provided for the full duration of the work injury, and unlike many other states, Louisiana workers are able to choose their own treating physician. Under some conditions the employee may be required to get their employer's permission if they are switching medical providers in the same specialty. After 2010, permission may be needed from the employer or insurance company for non-emergency care which exceeds $750. Lousiana Temporary Total Disability Benefits (TTD) - Temporary total disability benefits (TTD) are paid to Louisiana workers who are injured from a work-related accident and are unable to return to work. TTD benefits are paid at 2/3 of the worker's average weekly wages at the time they were injured. Louisiana workers' compensation temporary total disability benefits according to the yearly adjusted maximum and minimum levels. Injured employees should receive their first TTD payment within 14 days from the date they reported their Louisiana work injury to their employer. TTD benefits are paid weekly and there are no limits on the number of weeks they can be paid. TTD benefits will end when the employee is able to return to some type of work or the treating doctor determines they have reached their maximum medical improvement level. If an employee has reached their maximum medical improvement level but is still unable to work, is permanently disabled or is unable to earn at least 90% of their wage prior to their Louisiana work injury they may be entitled to another type of Louisiana workman's compensation benefit. Lousiana Supplemental Earnings Benefits (SEB) - Supplemental earnings benefits (SEB) may be paid to employees who are no longer temporarily totally disabled and have returned to work but are unable to earn at least 90% of their previous income. SEB benefits equal 2/3 of the difference between the injured employee's average weekly wage prior to the work injury and the wage amount they are currently earning. Lousiana Permanent Partial Disability Benefits (PPD) - Permanent partial disability benefits (PPD) are paid to Louisiana workers who suffer from a work injury which causes permanent loss of body function or disfigurement. PPD benefits may be paid even the Louisiana worker does not miss a substantial time from work. The duration and the amount paid for permanent partial disability benefits will vary based on the severity of the work injury. PPD benefits may be paid up to 100 weeks for serious scarring, hearing loss, vision loss, damage to internal organs or other catastrophic injuries. Lousiana Permanent Total Disability Benefits (PTD) - Permanent total disability benefits (PTD) may be paid if a judge determines the injured employee is unable to perform any type of employment for the remainder of their lives. PTD benefits may be paid weekly until the employer is able to return to work. Under some conditions the employee and the insurance company may agree to convert the weekly benefits to a one-time lump-sum PTD payment. The settlement amount must be approved by the Louisiana Office of Workers Compensation. Prior to accepting any type of permanent total disability settlement it is important to contact a Louisiana workers' compensation lawyer. PTD benefits may affect a worker's Medicare and Social Security Disability Insurance benefits. Lousiana Death Benefits - Death benefits can include wage loss payments made to the surviving dependents of a deceased worker's family. Wage loss compensation is paid as a percentage of the employee's wage. Death benefits may also include payment for burial expenses up to maximum amount ($7,500). Louisiana workers' compensation law may also allow the biological parents of the deceased employee to receive compensation if there are no surviving dependents. Lousiana Vocational Rehabilitation Benefits - Louisiana Revised Statute 23:1226(B) states “it is the goal of rehabilitation services to return a disabled worker to work, with a minimum of retraining, as soon as possible after an injury occurs. Vocational rehabilitation services first will attempt to help the injured worker return to their current job, if this is not possible the employer will attempt to make modifications to the job to help the employee. If attempts to return a worker to the previous employment are unsuccessful, vocational rehabilitation services can help the worker find another job which is suited to the employee's skills, provide on the job training, or help the employee complete a variety of retraining programs.